17 | October | 2012 | Plan. Shop. Eat. Live. End product. Tasty and Healthy. The benefits of the Indian spice, Turmeric, are immeasurable. It’s a heart healthy spice that helps to clear out your arteries and is anti-flammatory. I add it to a lot of different things and make sure that I have it somewhere in my diet each day. With the colder weather settling in, a warm snack is necessary! I’ve discovered a taste for Turmeric PopCorn and am excited to share this simple recipe with you. Note – I pop my own popcorn on the stove. It’s simple. Just start with a wok, popcorn kernels, and extra virgin olive oil. Heat a few teaspoons of oil in the wok on the stove. Add in about 1/4 cup of popcorn kernels. Cover the wok and let it pop. It takes about 5 minutes and as soon as you hear the popping noise slow down, it’s ready. The next step is to get a container with a cover. You’ll need this to mix up the popcorn. Place some of the popcorn into the container and add in a drizzle of extra virgin olive oil and three tablespoons of turmeric. Cover the container and shake, shake, shake! Shake some more! The goal is to evenly distribute the oil and spice. The olive oil will naturally stick to the popcorn and the turmeric will stick to the olive oil. This is a great snack! I bring a cup to work each day and get the added extra benefit of fiber during the day. Hint: the popcorn tastes even better if you let it sit for a day. 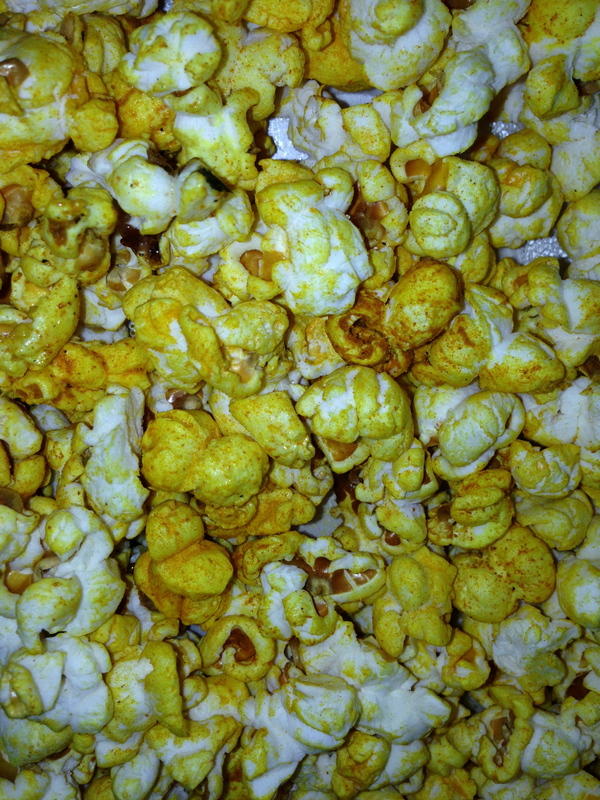 The flavor from the turmeric settles into the popcorn and has more of a kick!